Business as usual, you might think, after seeing that Ducati holds six of the top 10 places in the World Superbike series after the first 2008 double-header round in Qatar. Still, there’s more to the story than Ducati’s successful tantrum-inducing threat to quit the series if they weren’t allowed a displacement advantage over the four-cylinder bikes. Superpole went to Yamaha Motor Italia’s Troy Corser, Fonsi Nieto, (nephew of Angel Nieto, winner of 90 world championship races and 13 titles) took his first WSB victory in his first ride with the Alstare Suzuki team, and Kenan Sofluogu kept it up in his first-ever superbike race to card a 10th and 12th for the HANNspree Ten Kate Honda team for which he won the 600 cc Supersport title in 2007. And famous bedwetter Max Biaggi made a successful transition to a "customer" Ducati from the Alstare Suzuki he rode in 2007, carding two podiums with a second and a third. Ten Kate was also pleased that Moto GP exile Carlos Checa took a sixth and an 11th to put himself into eighth in the standings. It all looked so familiar in the first race, as Xerox Ducati top gun Troy Bayliss got a moderately bad start and then sprinted to the front, where he had a remarkable battle with the other front-runners, literally running off the track with apparent front tire problems several times before getting by Biaggi’s Sterilgarda Go Eleven Ducati on the last lap. 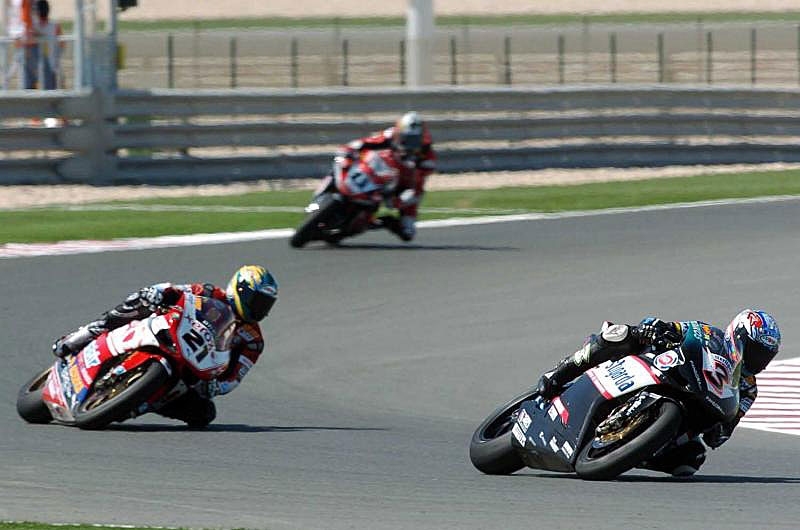 Biaggi repassed, but then ran wide and Bayliss took him back. Suzuki hopes were high when Max Neukirchner led most of the first half of the race for the Alstare team, eventually fading to fifth as his rear tire went off. The Suzuki had nearly 10 km/h top speed on the other bikes in the event. 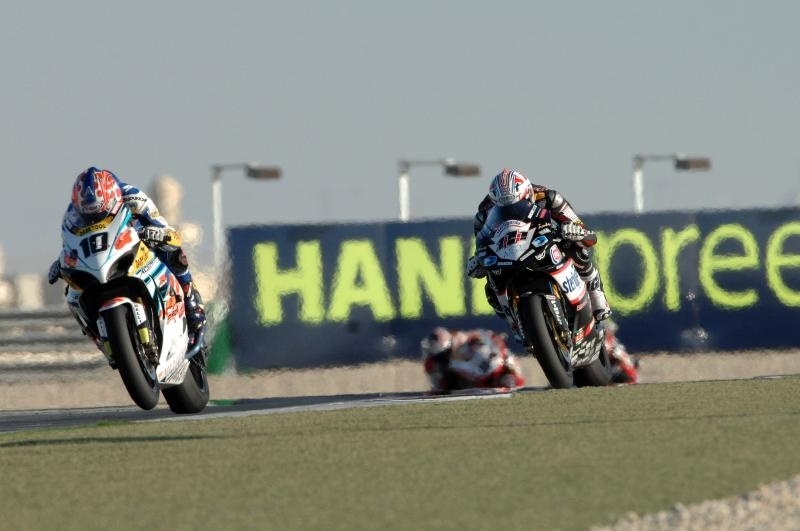 It was his team-mate Nieto who came through in the second race, however, after Corser and Haga dropped back from the early lead, apparently with tire issues, to leave Biaggi and team-mate Ruben Xaus racing with Nieto up front and Bayliss not far back. Nieto pushed past the Xaus/Biaggi duo with three laps left to go and held on, with the factory Xerox Ducatis of Bayliss and Michel Fabrizio fourth and fifth, plus former factory guy Lorenzo Lanzi bringing his R.G. Team Ducati next, making it five of the top six for the Italian factory. Nieto was on top of the world, saying, "This is my first WSBK win! … I used the same bike with the same set-up in both races, though I did have the traction control on a harder setting in the first race and the bike was not as comfortable to ride as it was in race two. "In the second race, I was able to conserve my bike and the tires and finish strongly and that’s why I won. … I know there are people out there who didn’t think I could be a winner, but today I proved them wrong!" Next event is at Philip Island in Australia next weekend.